Hotmail will keep your email for quite a while as long as you access it periodically. And if nothing goes wrong. Then you may have problems. Do you know how long the item in the hotmail-inbox is preserved? In other words: when will the messages automatically be removes by MSN? Furthermore: does MSN keep a log of all mails received on the incoming mail server? The reason I ask is that I receive legally important mails which I want to be able to reproduce or proof its existence. In my opinion, if you need it for legal purposes you should not, not, NOT be using Hotmail. Or any free email service, for that matter. I have nothing against them, per se, they're fine services when used properly. But if you saw the constant stream of questions I get relating to lost accounts, lost email and worse, and the inconsistent or total lack of customer support at times, you'd understand why I take such a hard line on free email accounts. I'll answer your question, but I'll also recommend some alternatives. First, I have to say this: I am not a lawyer, and this is not legal advice. In fact, one of my pieces of advice below will be to confer with a lawyer for the requirements you might be facing in your situation and jurisdiction. To the best of my knowledge most email services do not keep a log of incoming email. They deliver it, and then it's up to you to do with it what you will. The amount of data to keep a log of everything would be enormous. However, whether they do or do not, is also not something I would count on at all. "When accounts are lost, everything is gone." As long as you keep the account open, and access it at least once a month. As long as you do not exceed your storage limits. As long as your account is not lost, compromised or stolen. Of course, everything is subject to change without notice, but that's a fairly basic list for any provider. I hear about it every day. Which is why I've been saying for years now: don't rely on any free email services as the only place to keep anything important. If you rely on Hotmail (or Gmail or Yahoo Mail or whatever mail) as the sole repository for important documents (apparently legally important documents in your case) you are playing with fire. You are at the mercy of that service, and if something should happen and you lose access you may have no recourse. None at all. My favorite way to back up services like Hotmail or Gmail is to configure a desktop email program to download email to your PC, where a) it's in your control, and b) you can back it up as you backup the rest of your computer. But that's just one option. In fact, if you have legal issues around which you're about to rely on email, I suggest you speak to an attorney. Hotmail may not be enough (especially if you lose access), downloading may not be enough, you may need to take additional steps (even, perhaps, printing the messages out). Again, your attorney can advise on what you need to do to make sure you're safe. What I can tell you is that relying on free email services is not something I would feel safe doing, at all. You are kidding, right? This person really asked this question? Oh dear. Oh d..d..d...dear. I do sincerely hope I never do business with this person. If I were ever doing business of a legal nature with anyone and they had a Hotmail (or Gmail, or yahoo Mail) address, I would run, not walk, for the nearest exit. These e-mail addresses are toys, for convenience only. I have several free mail accounts, but I pay for a premium account for one of my accounts with a free mail provider, GMX.net. Does the fact that I pay for it give me more rotection than the free version of the same account? I have always assumed it would thats why I shell out a few euros evers month. But this causes me to have some doubts. I've always shied away from using the email address which comes from my internet provider as I don't want to lose my address if I change providers. Been using Hotmail for years. Works OK, never lost anything. I believe that Leo is correct if your email is for legal purposes, perhaps a domain name to lock your emails in place. If you use Hotmail, then Microsoft Outlook is a good investment. Install the "Outlook Connector" plug-in, which keeps your local Outlook (.pst) file in sync with your Hotmail account. This way, if something happens to your Hotmail account, you have a local copy which can be uploaded to a new mail host. Note that you do not need to use the connector with Outlook, but it is the nicest option and works inherently with Hotmail. I really appreciate you. Wow ! It was a great information. Thanks for your kind suggeations to people like us. Thanks Leo; I always learn something; am an IT innocent so depend on your goodself for info. Kind regards & best wishes for the holidays. This is an interesting problem and answers. I have email with the internet provider that I use and while away on holiday while depending on email for confirmation of trip plans they were upgrading and totally cancelled my email and internet (accidentaly??). So any incoming emails were lost.So much for the paid email servers. And a rule of thumb for me is to never email anything that I would not want the whole world to see. You are far better off dumping all email messages asap. Far more damage has been done by disclosure of old email than by loss of it. i.e. "climategate" Actually I would like to see a free email service that guarantees they don't keep any records, backups, logs, etc. When I dump it daily it can never come back to bite me. I use Hotmail and email provided by my ISP, both of which I download using Windows Live Mail. I use the freeware edition of MailStore to archive all my email. I then backup the archives created on my local drive to external media. "MailStore Home enables you to backup all your email messages from multiple applications and accounts into one secure and persistent archive. Lightning-fast search, one-click backup, powerful export - all information from your email is at your fingertips anytime. 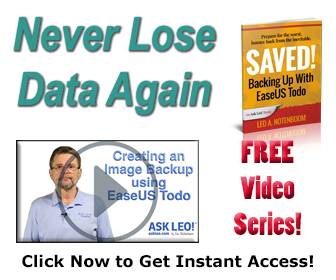 Never lose important email again!" Hopefully this will be of use to someone concerned about preserving emails. I have two free e-mail accounts to provide contact info for two specific personal interests. For the e-mail that can make life difficult if lost or misplaced, I've used fastmail.fm for several years. Reliable service. Reasonably priced with several price and service levels. Sorry, but it's unlikely that Hotmail questions will stop. There are real people with real problems that need help. That's what I'm all about. I agree that they're often using Hotmail improperly and should be doing something different, but the fact is a large number of questions I get are all Hotmail related. I'd be doing a lot of people a huge disservice if I ignored the tide. I do try to expand the Hotmail questions in to more general purpose questions (i.e. the lessons, including this article's, often apply to "all free email accounts"). With regard to back up and reliability for free accounts. I use gmail for my main account, 6 years so far. I like Gmail, it is reliable, a great spam filter and it is evolving into a very useful utility for communication and storage. I have had few problems with it in the years I've been using Gmail. Back Up: I have two external hard disks of scanned important documents. But for conviniance I send those docs to gmail in case I am away from my home for easy access. For important business emails or other important email. I forward key email on an automatic filter to go to a yahoo account and to an ulternate gmail account. This way I create a back up without having to remember everytime. Thus I have several Yahoos and several gmail accounts, but only really use one gmail, the others are simply storage. I set a reminder to log into all of my accounts using Google's calander. But to be sure, any important emails are always printed out. Being a gmail user, logging into Yahoo is irritating. The adverts make me nuts, on the other hand, Gmail is so non intrusive, the desktop is plesent and the folder system is great. I do find myself actually clicking on some of the advert feeds on Gmail just because often enough they spark my interest. Again, non intrusive; just there enough, as if being polite. And with that, Leo is right, back up everything important not trusting anyone particular service or devise. I don't understand all of the ado over emails. If they're that important, either make two copies of them (printers costs as little as $30) and store them in separate places, or buy one or two of those flash drives. You can get Kingston ones for around $15 (4GB). I'm not a business person, but I could imagine if I were one, the emails would pile up fast. But I print the important ones and dump the rest. Why is backing up emails such a problem? There's enough work to do in backing up a computer, why complicate things by throwing the emails in? I gave what I feel are two methods of safekeeping emails, start using them. Thanks for the Hotmail answers. Once in a while something in an email either teaches me something I was not aware of or makes me relook my security and behaviour. One thing not mentioned here is that hotmail can also mysteriously loose ALL your email folders in the account. When this happens they will never answer you directly. If you are persistent the might let you know they regret what happened but will also accept no responsibility. The regrets will be in a form letter, not a personal response. I lost a message that was of historical importance that can never be recovered. I now save those mails to files on my computer and back those files up! "Hotmail is a free (you get what you pay for)"
Treat all e-mails as if they were postcards, i.e. anyone can read them, and may even be able to edit them, before OR after you see them. You can use the services of bigfoot.com to redirect your mail. You'll have one permanent email address (name@bigfoot.com). You can change your email provider, update your new email address in bigfoot and get your mail to your new address.